I'm only two years into my exploration of whiskey but this is by far my favorite scotch. Selfishly, I hope you're able to keep up the pace you've set: 41 posts per month is quite the accomplishment! Hey JSJ! Thanks for being the 2nd person to post a comment on my fledgling blog! 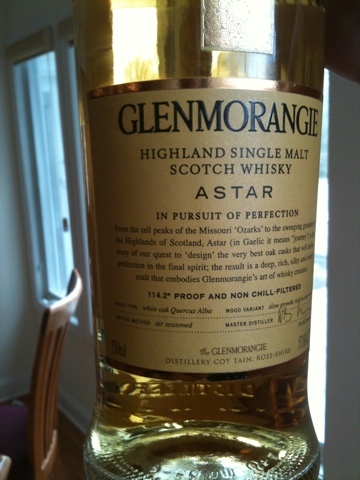 Yes, Astar is one my favorite Scotches too. Unlike Islay malts, where exterior flavor sources such as peat smoke, salt air, and dissolved organic compounds in the water play a big role in the flavor, or the Sherry bombs and other secondary wood finishes play a big flavor role, Astar is becoming a rare example in making a flavor bomb out of only the very soul of the whiskey: the malt and the oak alone. It's a very special creation. I almost feel as if Lumsden is redeeming himself as a master distiller for having ignited the secondary cask aging revolution by showing that he is the absolute master of just the naked oak. It's a tour de force of elegant simplicity. Full disclosure, I had been writing these posts down for months before creating the blog. Many were originally written as reviews for Amazon (I'm an Amazon top 500 reviewer (previously top 100 but I've become lazy)). Amazon is a lousy place for liquor reviews in the USA, however as they don't sell liquor and the listings come and go all the time. Anyway - that's how I posted almost 30 reviews on the first day. Keeping up such a pace in real life would affect the palate (and leave you passed out under the table)! According to Michael Jackson's Complete Guide to Single Malt Scotch (great resource by the way), the Astar barrels are actually filled with Jack Daniel's for four years. As far as I can tell only in the US is there a legal distinction between bourbon and Tennessee whiskey. So it's perfectly fine for the Scotch distillers to say ex-bourbon cask when in fact they are also using barrels that previously contained Tennessee whiskey. Thanks for that, Eric! I've amended the review to fix the erroneous mention of "Kentucky". I was bringing my incorrect bias that "bourbon" means "Kentucky" (it doesn't). Any corn whiskey a mashbill of 51%+ corn, barreled at less than 62.6% abv into first fill charred oak casks and aged at least 2 years is legally "bourbon" - no matter where it is made in the USA. As the gov. of Texas once said in a debate: "oops". And thanks for the useful data. I'll try to see if knowing it was Jack in those special barrels informs the palate any while sipping Astar.